As the connection between data and building materials grows ever closer, with digital information not just informing plans but actually being used to create the material that will construct a building—robots are necessarily playing a large role in architecture. Yet the use of robots in architecture has not been treated comprehensively until now. 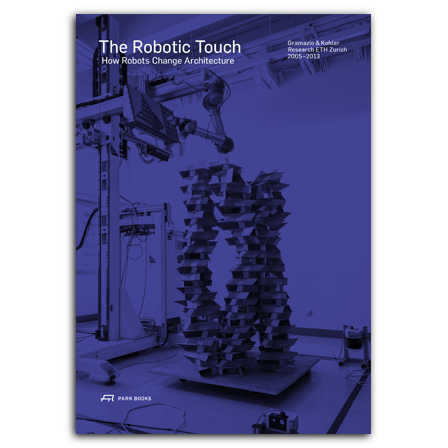 The Robotic Touch features thirty-three research projects on robots in architecture originating at the Chair for Architecture and Digital Fabrication at ETH Zurich, documenting various methods and concepts relating to the use of robots in architecture. In particular, The Robotic Touch offers the first full analysis of the material and constructive aspects of robot-based building projects—and draws out the implications for architectural design on the growing use of robots. The volume is rounded out by five topical essays on broader aspects of the subject, along with technical data-sheets and a helpful glossary. is an architect and Professor of Architecture and Digital Fabrication (Gramazio Kohler Research) at ETH Zurich. He also runs his own architectural studio in Zürich together with Matthias Kohler. is an architect and Professor of Architecture and Digital Fabrication (Gramazio Kohler Reserach) at ETH Zurich. He also runs his own architectural studio in Zürich together with Fabio Gramazio. is an architect and senior assistant at the Chair for Architecture and Digital Fabrication at ETH Zurich since 2011.